When and how did you first get involved with the Cincinnati Zoo & Botanical Garden? My first official day at the Zoo was August 27, 1997. When I graduated college, I had this plan to move back home to Northern Kentucky, call my girlfriend and get married—which I did. But I also needed a job. What I wanted was the opportunity to be actively engaged in making a difference—whether that be with a nonprofit or with a sports team. Shortly after I moved back, I found out about an open “Media Specialist” position at the Cincinnati Zoo and applied. I didn’t have a big zoo background, but I had the PR and advertising experience. Twenty years later, and it's been—and still is—an amazing ride. The work that we do here—it gets in your blood. One of the reasons the Cincinnati Zoo performs well is because it’s a zoo of “firsts” and “mosts.” Is there any surprising Zoo trivia that people might not know about? Years ago, we noticed that our annual water consumption—used for the Zoo’s irrigation, animal pools and indoor habitat cleaning—had reached a staggering amount. Knowing that Cincinnati's sewer system is the oldest in the country, and heavy rains mixed with daily water consumption can cause sewage to overflow into the Ohio River, we wanted to find a solution. So, we fixed leaks, upgraded our filtration system and installed underground storm tanks—the largest of which live under the Africa exhibit. The tanks, alone, keep 15 million gallons of water out of the sewer system annually. They not only help reduce issues of flooding, but also help taxpayers save money. If we're able to keep money in our neighbors’ pockets and water and sewage out of their basements, that's a plus for all of us. The Zoo is a great Uptown example of conservation—both conserving our resources and our communities. How have some of the Zoo’s efforts helped lead broader efforts in the surrounding Avondale neighborhood? Over 10 years ago, we converted all the lights used during the PNC Festival of Lights to LEDs, which conserves energy and saves us about $50,000 a year. Recently, with local groups, homeowners and organizations in mind, we began expanding LED efforts beyond the Zoo to help them do the same. The Zoo’s Light Up Avondale project started with seven recipients, including nonprofits and churches, such as Gabriel’s Place, Urban League, Cincinnati Christian College, Wesley Education Center, Greater New Light Baptist Church, Greater New Hope Baptist Church and Zion Church. It’s such a simple change, but one with a huge impact. We've received a great response from the community about how the switch has helped them move funds to initiatives closer to their cause. What long-term impact does the Zoo anticipate this Avondale lighting initiative will have? I think the long-term effects are endless, really. And these are very small things that anybody can do. They don't require a ton of money and it can be a gradual approach. You're doing everything from improving air quality to creating safer, cooler, brighter spaces. The seven recipients that I just named—they're collectively saving about $63,000 per year and reducing energy by about 473,000 kilowatt hours— equal to powering the average US household for 44 years. In aggregate, these seven non-profits will save over $470,000 on their electricity bills over the next 10 years by going all-LED. They’ve also made a significant environmental impact by saving 731,000 pounds of carbon, which is the equivalent of taking 70 cars off the road or planting 8,500 trees. So, I think any neighborhood would say "I'm in." It definitely brings our neighborhood together. Those are great examples of how the Zoo has impacted the community, but in what ways has the surrounding community helped the Zoo get to where it is today? The Zoo is 143 years old, but our job is to not look our age. Although our conservation efforts have helped us save and reallocate funds, we still rely on the community for about 17 percent of our annual budget. Every five years, the Zoo’s operating tax levy is placed on the ballot—and every five years, passing the levy becomes more crucial. The tax levy supports the basic needs of the Zoo, including animal care, horticulture and maintenance. We have 80 buildings at the Zoo and 40 percent of them are 75 years or older. Three of them are over 100 years old. So, as you can imagine, 80 historical buildings require a lot of upkeep. For example, the cost to replace the historic elephant house roof is over $2 million. Over the years, the expenses that go along with our levy have gone up 54 percent, but our levy dollars have decreased by 10 percent. So, you know we'll be out here in full force when May comes around to try and pass our levy. We can’t talk without mentioning the breakout star Fiona! Since she came on the scene, how has that changed the composition of or the work within your department? I can absolutely say that it completely flipped our marketing and communications department upside down—we’re talking about an international event that has lasted well over a year. The entire experience has been unbelievable. I've been here for 20 years and have never experienced anything quite like this. The Hamilton County Sheriff's Department made her an honorary deputy, she received her own library card, she's witnessed a marriage proposal and she’s received thousands of messages from over 90 countries. I kind of feel like I'm an agent for Beyoncé. And it's accurate too; like Beyoncé, she only has one name. At this moment, I’d say that about half of my day includes Fiona-related tasks. Six months ago, it was probably closer to 75 percent. Fiona has four books out and two still to come, and each of those comes with a lot of conversation. Consider each of the other companies we're working with—from Listermann beer to Cincy Shirts to Rookwood Pottery—and the list of work writes itself. It's a hefty job, and those are just the things that come to fruition. There are still things that I'm pitched every day. 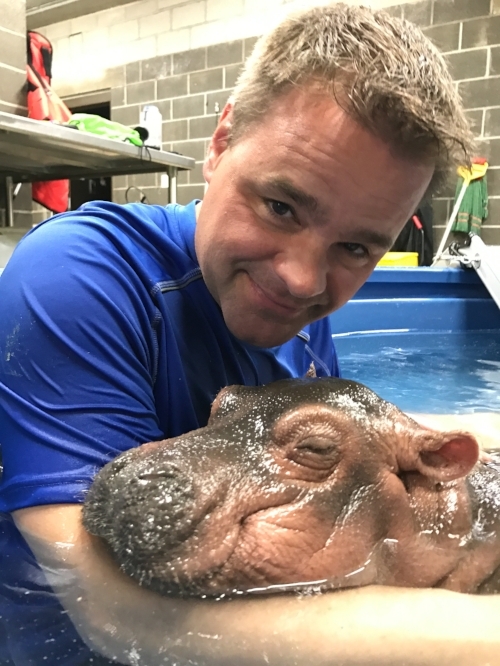 Beyond the increased positive attention the Zoo has received, how has Fiona’s arrival changed the Zoo? We're seeing more people from out-of-town come to the Zoo than ever before, which is great because they're staying at our hotels and they're going to our local restaurants—they’re boosting our local economy. It's also helped bring an amazing awareness to our care team. Millions of people are now inspired by the work that our staff does every day, which is really important to me. Fiona has this amazing ability to connect with her fans. We get letters and emails from people that have said, "Fiona has saved my life; Fiona has given me inspiration; Fiona has gotten me through this terrible disease; I relate to Fiona because I was preemie, myself." To some people it's just another hippo, but to others, she's this huge source of inspiration. And it’s really neat to be a part of that. And finally, are you allowed to admit who your top three favorite animals are at the Zoo? I've been here for 20 years, so names have gone up and down over the years. Fiona, of course, makes the top three. Additionally, I’d have to say Winsol the aardvark—who doesn’t love something that’s ugly and cute at the same time—and Micu the red panda. I’ve had the opportunity to experience a personal encounter with each of these animals, which has grown my appreciation for them. I think that’s just what we do at the Zoo, and why we do it. We have this mantra, "Close enough to care." So, that's why you'll see a lot of habitats at the Zoo that allow visitors to get nose-to-nose with the animals with a wall of glass in-between. If you can get this close and appreciate that animal, then you’re naturally going to care about them. We can bring people to the Zoo and they can see these animals, which act as ambassadors for their wild counterpart. In doing so, we hope they walk away with a new fondness for wildlife. Cincinnati’s Uptown Innovation Corridor is bustling with future-focused development plans. That’s why we asked Chris Dobrozsi, Neyer Properties VP of Real Estate Development, to discuss the formation of MLK Investors I LLC—the partnership of Neyer Properties, Inc. and Kulkarni Properties—and what the Uptown Innovation Corridor means to them. MLK Investors I will oversee development on the northeast quadrant of the Uptown Innovation Corridor, at MLK and Reading. Q: How did MLK Investors I first form? Had Neyer Properties and Kulkarni Properties worked together previously? A: We had not worked together prior, no. It all came about in the fall of 2015 when [Kulkarni Properties President & CEO] Shree Kulkarni acquired over twenty parcels surrounding the planned interchange. He had a good vision, but realized that a project of this scale required a partnership with a developer who had experience in large mixed-use projects. That’s where Neyer Properties came in. Q: What drew you to the Uptown Innovation Corridor? A: Uptown is the front door to roughly 50,000 daily jobs and its location is near the University of Cincinnati medical campus. That's a no-brainer. We looked at the opportunity beyond the development footprint-- we looked at this as the future of the Greater Cincinnati region from an economic development perspective. Kulkarni Properties clearly embraced the vision from day one of what the Uptown Innovation Corridor is to become, and we saw the opportunity and wanted in. Q: What do you believe is the key to the success of the corridor’s development? A: Think big, no bigger and act boldly. This corridor has the foundation in place for the creation of over 10,000 new jobs bringing in $2 billion in investment. To capitalize on this opportunity, we must collaborate at the regional level to attract the most innovative companies, not only to the Uptown Innovation Corridor, but to the entire Greater Cincinnati area. That’s why Uptown Consortium’s community research, economic development studies and visioning work have been so important. The results to date are that each developer at the table is equipped to do what's best for all locations—and the dynamic between all developments is what makes this such a nationally-unique opportunity. Another key is that the Uptown Consortium, the developers and the corridor’s surrounding neighborhood leaders gather regularly to discuss how our work aligns with the communities’ long term goals. That last piece is probably most important, because we all know that for the corridor to be successful long-term, the neighborhood has to be successful long-term. We want this to be successful for 50-years plus, right? By collaborating and working together, we’re planting the foundation for long-term success. Q: What does community engagement mean to MLK Investors I? A: Any development starts with community engagement in a collaborative environment, working in a true partnership. The surrounding community is a vital partner in the vision and long-term success of the corridor which requires this true partnership.. They're the ones that live there day-in and day-out. We must understand what's important to them, and they must know what's important to us as developers, that’s what a partnership is all about.. We all have to work together to create something in everyone’s best interest. Again, if it's not done with the best interest of the community, then it won't be successful long-term. So, we start with community engagement. Q: Will minority and neighborhood jobs be a part of MLK Investors I’s economic inclusion process in the northeast quadrant? A: Amen. That will be a major piece of it. Again, getting community buy-in from two fronts. We have to understand what is important to the neighborhoods--what's going to lead to their long-term success, and the neighborhoods have to understand what the market means to us. Unless we work together, these things won't be successful long-term. We're advocating for one another. We’re proud to be long-term holders of real estate. We don't develop and sell, we’re in it for the long haul. We're invested in this community now and we'll be even more invested in the future. With that attitude going in, we ensure that it’s going to be a win-win. Additionally, Uptown Consortium’s partners at WEB Ventures--Henry Brown, Bill Witten and Howard Elliott--are a critical partner ensuring inclusion evert step of the way. Q: Is the current development plan still to create a mixed-use space for research and innovative companies? A: Yes—it's going to have residential; it's going to have retail; it’s going to have hotels; it's going to have innovative office; and it's going to have research. That's the kind of mix it takes to encourage collaboration and innovation. We plan on having what I’ll call an 18-hour, live-work-play mixed-use development. What you'll see with many innovative companies is the desire to work in a centered community; they talk about collision points. So, it’s up to us to determine how we bring people from different innovative companies together—where they can collide with one another and build relationships. We plan to design central gathering areas, both inside and outside of the buildings, with these collision points in mind. We want to give them a reason to connect. Q: What is MLK Investors I’s current development timeline? A: Now that we have a preliminary site plan approved by the surrounding Uptown neighborhoods, we are going to move forward with design development. What that means, is that we’ll start to determine what exactly phase one of this development will look like. The first phase is positioned at the corner of MLK and Reading and will include a hotel, an office building and office amenities. We have the end—the big picture—in mind for the whole quadrant, but for now, we're just focusing on the first phase. Our goal is to break ground by January 1, 2019. Q: Speaking of breaking ground, are there any specific milestones to look forward to in 2018? A: There's about a thousand of them—between zoning, financing, securing tenants, deciding on final design—but they all end with breaking ground on phase one.